Shortly after bombing the Tokyo Gas and Electric Company, Pilot Lt. Harold F. Watson banks the B-25 Whirling Dervish steeply to avoid a Japanese cruiser that lay directly on the aircraft’s escape route to China. It was the ninth of sixteen aircraft to leave the carrier USS "Hornet" on the audacious April 18, 1942 Doolittle Raid on Japan. That United States Army Air Forces bombers could launch from a U.S. Navy aircraft carrier was inconceivable at the time. President Roosevelt claimed the aircraft came from a secret airbase in the mythical Shangri-La. American bombers striking the Japanese homeland and passing within sight of Mount Fuji, the most sacred mountain in all Japan, delivered a succinct message to the warring Axis nation: America, the Sleeping Giant, had begun to stir. 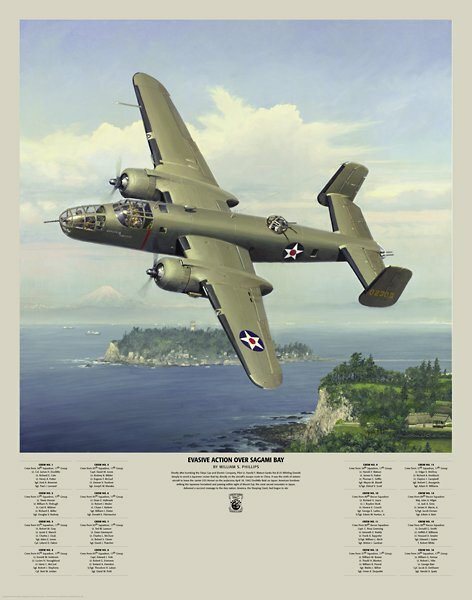 "Evasive Action Over Sagami Bay" is an authentic historical document, offered as both a fine art print and canvas edition. This is a unique opportunity to own and preserve an important moment in aviation and U.S. military history. Signed by Doolittle Raiders.